You can select multiple purchases to make necessary changes/corrections. Click Date label&apos;s checkbox to select all the purchases present in that page. And you can choose from the options presented to take necessary action. Click Delete to delete the purchases permanently. 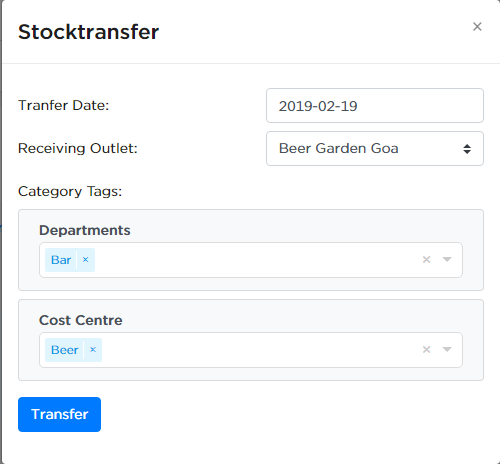 Click Stocktransfer to transfer the stocks to other outlets. Enter the Transfer date, select the outlet from the dropdown and enter the category of the items transferred. Click Transfer to transfer the items. Once you click Transfer you will be redirected to TRANSFER -> SKU page and you can see the transfers made. Click Update Category to make necessary changes to the categorization of purchases. Select category types from dropdowns and click Update to change/replace the existing category. 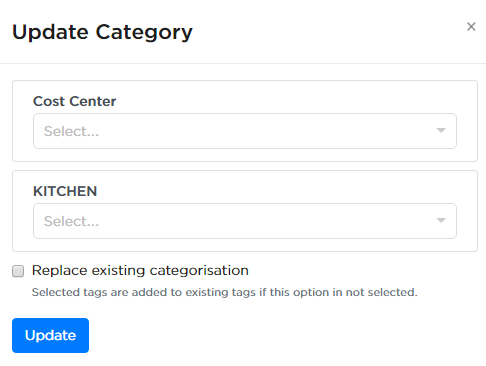 Replace existing categorization: This is selected to replace the existing tags with the selected tags. For e.g. if you have a purchase cost center tagged "Beverages" but you would like to replace it with "Liquor", use this selection.